Homemade Egg Noodles with four simple ingredients and no special equipment. These delicious noodles are perfect for soups, stews, stroganoff or plain with butter and cheese. I feel like homemade noodles is like most things. You don’t realize how amazing a dish is with the extra homemade factor until you try it. Like using store-bought flour tortillas versus homemade or uncooked tortillas. Or using a homemade “cream of chicken soup” in a recipe instead of the stuff from the can. At first you may think it wont make much of a difference in taste, but once you’ve tried the from-scratch version you’ll turn back! My mom always made her awesome chicken noodle soup with homemade noodles. She can whip them together so quickly, and the ingredients are ones we always had on hand, so it was no big deal to her. What are egg noodles made of? Eggs, flour, milk and salt. So easy! You don’t need a pasta machine. 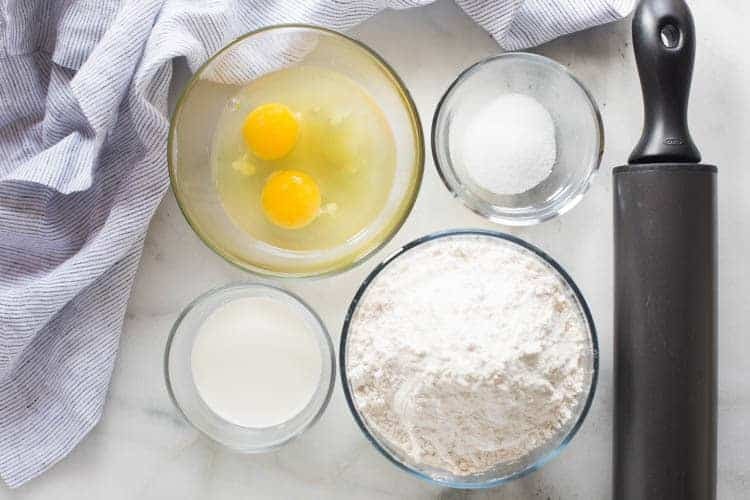 All you need are those four ingredients, and a rolling pin. Anyone can make these! This recipe is very forgiving. 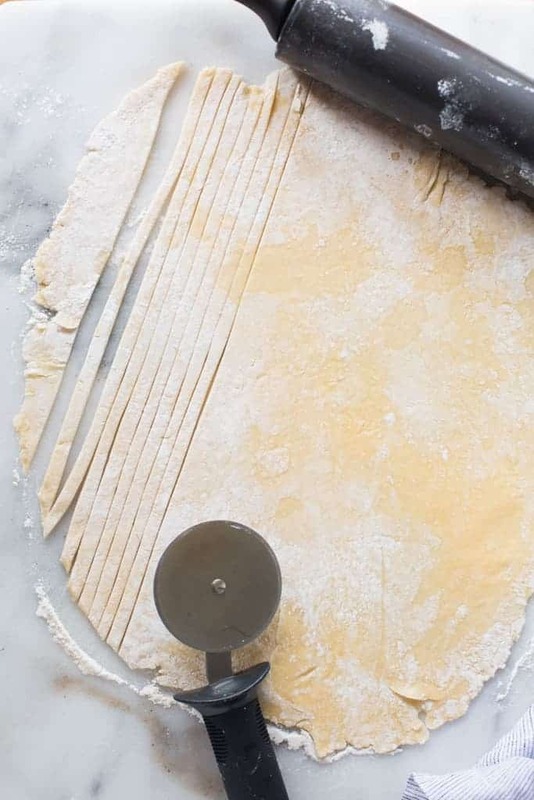 Egg noodles are not like pie crust or pastry dough where you have to be cautious with how much you handle the dough. You can’t over-mix them. If you feel like the dough is too “dry” you could add a little splash of water or milk. If you feel like it’s too sticky, add another sprinkle of flour. You really can’t mess them up. 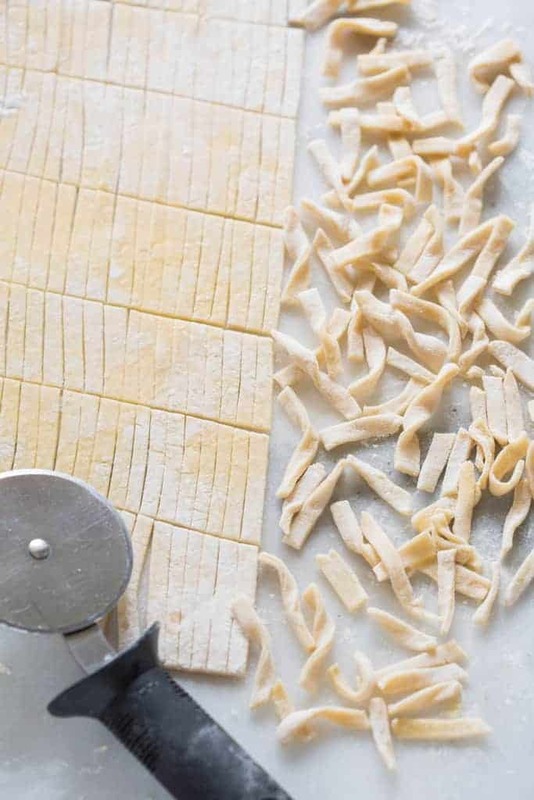 I’ve found that allowing the dough to rest for 5 minutes before rolling it out, and again after rolling it, makes it easier to work with and keeps the noodles from “shrinking” as you cut it. Resting is optional, but I’d recommend it. Cover the dough with plastic wrap or a light towel while it rests. You can cook these immediately after making them by adding them to a pot of boiling soup–they are my favorite to add to homemade chicken noodle soup. You can cook them in boiling water until tender and serve them with Swedish meatballs, Beef Stroganoff, or plain with butter and parmesan cheese. Drape them on a pasta drying rack or on a clean towel and let them dry completely. Transfer them to an airtight container until you’re ready to cook them. You could also freeze the dough in a freezer-safe ziplock bag. Then, cook them, from frozen, in a pot of boiling water or soup. Dry them out (just dry enough that they wont stick together) by laying them on a dry towel, or a piece of parchment paper, or pasta drying rack. Then place them in a ziplock bag or air-tight tupperware and either refrigerate them for a few days, or freeze them for up to a few months. Then, cook them, from frozen, in a pot of boiling water or soup. Homemade Egg Noodles with four simple ingredients and no special equipment. These delicious noodles are perfect for soups, stews, stroganoff of plain with butter and cheese. Mix eggs, milk and salt together until smooth. Stir in one cup of flour until smooth. Add additional flour, just a small spoonful at a time, until the dough comes together in a ball, but is still slightly sticky. Dump dough out onto a floured surface. Use well floured hands to knead the dough with your hands, until it's no longer sticky, about 3-5 minutes. Roll out onto a lightly floured counter until it's very thin -- less than 1/4'' thick or paper thin. 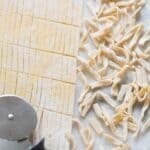 Use a sharp knife or pizza cutting wheel to cut the noodles into long strips, however narrow or wide you like. I like to roughly gather them with my fingers into a pile to make them more shapely, and not so flat. You could even twist some with your fingers to make them prettier. To cook them immediately, add them to a pot of boiling water and cook until tender to the bite, about 2-3 minutes. Drain and serve with butter and a sprinkle of parmesan cheese. Or add them to a pot of homemade chicken noodles soup. Or serve them with Easy Beef Stroganoff or Swedish Meatballs. Tips for storing, freezing, and making in advance are listed in the post above. This is the first time I’ve ever made noodles, it was great. I’ll have to roll out even thinner next time, but I don’t think you can mess this recipe up no matter how thick the noodles are. No more store bought egg noodles for me! I don’t know why I haven’t been making my own noodles all along. I’m seriously shocked at how unfussy homemade egg noodles are to make. Even with a couple minor mistakes they still turned out great for me. Now that I know, I’ll make them more instead of using packaged. Seriously, they seem harder to botch than pie doughs, biscuits or yeast doughs and they don’t take that long to make. I’d never made noodles before, but my husband wanted pasta and we were out. Our milk was sour, so I subbed in some melted butter, almond milk and oil for the milk and it worked fine. I used some kosher salt with larger crystals which was probably a mistake along with heavily salting the water. The noodles were just slightly too salty, but still very good. They were a little thick since I probably only got them to 1/8 inch and my cuts weren’t all that consistent in width, but they were still delicious. I never knew noodles were so forgiving of all my screw ups. Thanks for the recipe and it’s a revelation that fresh noodles aren’t a super hard thing to make and aren’t as easy to botch in a big way as many people might think. Homemade noodles really are so forgiving! Thanks for your comment and sharing your experience. Excellently easy! I like to add a little onion and garlic powder to the mix, also.